Developing hardware and software systems now involves integrating many IP blocks, many cores, and lots of software. To ensure that your system on chip (SoC) meets your design intent, verification technology is essential. Cadence offers verification solutions—from early software bring-up to use-case testing, debugging, and performance analysis—ideal for Arm-based SoC designs. Faster performance analysis and verification of Arm CoreLink™ interconnect intellectual property- (IP-) based systems. 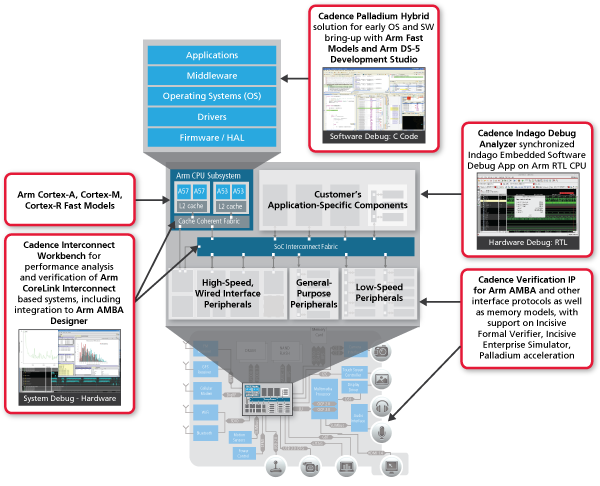 This is made possible through a new adaptable interconnect performance characterization test suite in the Cadence® Interconnect Workbench, along with Arm AMBA® Designer integration. Cadence has expanded its already market-leading support of AMBA protocols with the availability of VIP and Accelerated VIP for AMBA 5 CHI. You can take advantage of verification support across all simulators and the Palladium XP series. The Cadence Palladium Hybrid solution has been expanded to support Arm Fast Models for the Arm Cortex-A portfolio, including Armv8 processors for mobile and networking systems. In addition, since Cadence is a value-added reseller for Armv8 and Armv7 Fast Models, you gain a one-stop shopping experience. An automated flow from AMBA Designer into Interconnect Workbench means that you don’t have to manually specify the description of your interconnect. You can do many iterations of your interconnect and quickly verify and analyze the performance to achieve the results you need. To optimize performance inclusive of memory access, tap into CoreLink interconnect and memory controllers, which also work with Interconnect Workbench. The expanding collaboration between ARM and Cadence, and the availability of better ARM-based system design and verification automation, enables our joint partners to focus on innovation and getting their value-added products to market faster. The Cadence Palladium solution for embedded software development enabled by ARM-based Fast Models helps us reduce the system software validation cycle and ensures a smoother post-silicon bring-up. The continued delivery of innovating technology from ARM and Cadence is crucial to our ongoing success.